Remember those good old days before virtual reality video games and smartphones when we all used to spend hours up a tree, laying in the grass, or turning over rocks in the local creek? Use a length of paracord so it is easy for them to tie and untie. You can find loads of paracord color options on Amazon. Use this article from Home Made Gifts Made Easy on paracord bracelet making to make a paracord bracelet so they will always have their rope with them. Are you new to knot tying too? Check out this article from Cool of the Wild where they offer easy instructions for how to tie the 6 most important camping knots. What kid doesn’t love to build a fort? 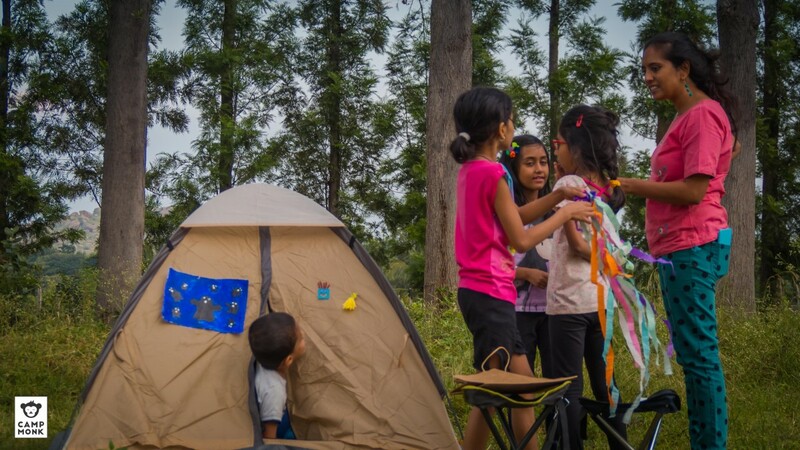 Whether you are stringing up a tarp to block the rain or fashioning a teepee from sticks, your kids will love to help you build a home away from home, even if it’s just for play. Check out this great article from Wild About Here to get started building your fort . Whether you want to get all the gear and try out fly fishing at the local river or you are building a rod from a stick, teaching a kid to fish can be a fun way to occupy them during a weekend camping trip and you might even spark a lifelong hobby. Here’s a great article to get your kid fishing at any age . If you’re feeling more crafty, check out this video from eHow to get you started building a simple fishing rod from a stick. Depending on how old your camping buddy is, you might not want him or her to be playing with matches or lighter fluid just yet. But that doesn’t mean they can’t help with the campfire. Not all sticks are created equal so it’s important to teach your child which are the best to use. If your child is older you can assist them in cutting small branches using a folding camp hand saw. Three words that should be in every outdoorsmen’s vocabulary. It’s important to follow the Leave No Trace rules when camping or backpacking so we can keep the natural world intact for the next generation to enjoy. So get the next generation of conservationists going early. Check out these Leave No Trace’s 7 Principal Tips for the rules you can teach your kids to follow when they are exploring the outdoors.